The BSO gave a phenomenal performance last night at Meyerhoff Hall of Baltimore’s native sons Frank Zappa and Philip Glass music. 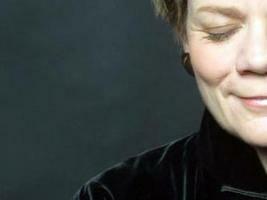 Marin Alsop continues to be a breath of fresh air in the staid classical music community by “breaking the rules” and generally embracing the present and the future. The BSO under Alsop’s able hand performed the admittedly tricky and complex notes of Mr. Zappa with great alacrity and aplomb. I was so thrilled to hear one of my favorite Zappa compositions, Outrage at Valdez, in a live performance. The eerie present day relevance (i.e. Gulf Oil Spill) as Ms. Alsop pointed out made the performance even more poignant. The BSO perfectly captured the mystery and mourning that makes this piece so moving. Ms. Alsop and the BSO should be given 10 stars for presenting such an ambitious evening of music. Hopefully this will be repeated in the future? Update: The Baltimore Sun gives an enthusiastic review here. 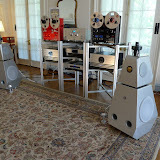 Yesterday, I attended the first day of the Capital Audiofest taking place at the Glenview Mansion in Rockville, MD. I have been looking forward to this event for months! I’ve posted some pictures of the first day. I’ll be returning today and tomorrow. I hope to post some thoughts on what I heard as I have time to digest everything. Interesting to hear a very short snippet of the great song Crayon Angels by Judee Sill on the Showtime series United States of Tara tonight. I had the rare opportunity to see her perform, at the Kennedy Center no-less, when she opened for Cat Stevens in the early 1970’s. I always loved her music and was very happy to pick up her reissued CDs when they became available. Her many fans include Andy Partridge of XTC! It is so sad that she led such a tragic life and died so young. Baltimore based prog band Oblivion Sun took the stage at Orion Studios last night. They were greeted by a packed house full of lifetime Happy the Man and progressive music fans. The band was in good spirits and performed a solid two hour set that included songs from their first album and as well as premieres from their forthcoming second album titled The High Places. The title track is and extended masterpiece by the prolific Frank Wyatt. Oblvion Sun is at its core longtime collaborators Stanley Whitaker and Frank Wyatt who formed along with Kit Watkins, Rick Kennel, and Mike Beck the original Happy the Man in the 1970’s. They went on to great fame and notoriety with two fantastic albums on Arista Records and performed extensively around their home base in the Washington, DC metro area. The current band includes Bill Plummer on keyboards, Bill Brasso on drums, and David Hughes on Bass. I have seen this current lineup several times and believe that they have really meshed and coalesced into a very lean and muscular performing unit. The sheer musicality and interplay is simply stunning and is a wonder to behold! This band should not be missed. Thanks to a comment to this blog made by knnniggett, there appears yet another way to deal with the RT2860 driver issue. This may turn out to be the definitive solution. The problem with upgrading to the unreleased kernel 2.6.33 is that it is unreleased. In the case of my RT2860 card it limits the speed to "G" 54 mbs speeds, and at least on my machine I could no longer suspend or hibernate properly. Apparently, there exists a package that installs backported drivers so that they will work on the current kernel. I just did this and I am happy to report it seems to work and I am running at "N" speeds. I'll have to test suspend after I make this post! And behold it works! You may find you need to change the setting in the Synaptic Package Manager under the Software Sources - Updates Tab and check mark the Unsupported updates (lucid-backports) and then reload the repositories. You could probably also do this from the command line with an apt-get update type of command. So thanks to knnniggett for the great suggestion. Ubuntu’s latest release, 10.04, was officially posted this week. Overall, it is a very impressive effort and a milestone for the Open Source community. I have installed it on a new cheap desktop I recently built and it runs fantastically with fast boot times and nice desktop eye candy. The one thing that spoils this effort is the continued hassles in getting wireless wifi cards working. I have a half dozen usb wifi sticks lying around and only one just works our of the box. I guess it wouldn’t be Linux if one didn’t have to at least compile a driver or two every now and then? Anyway, I recently purchased the Asus PCE-N13 IEEE 802.11b/g/n PCI Express Wireless Adapter. I bought the card on sale for $19.99 and on the basis that someone left comments that it worked in Ubuntu 10.04. Not sure what this fellow’s definition of working is but it doesn’t just work at least when you use WPA security. So, determined not to let this get the better of me, I embarked on a flurry of google searches. This card uses the Ralink RT2860 chipset which is used in many products. The problem from what I’ve been able to determine is that the WPA source code definitions are wrong by default. It’s not clear why this is so but that seems to be the case. The fix and ultimate configuration is fairly straight forward if one can find clear and accurate instructions. There’s the rub. I finally stumbled upon some good instructions but maddeningly they contained key errors that will surely frustrate the uninitiated. So, in the interest of helping those that follow, I offer my amended instructions that I have tested and believe to be accurate. With this guide you should be able to get a Ralink RT2860 based product running and connected to a secure router running WPA security and will do so after reboots. The following steps were performed on a unmodified default Ubuntu 10.04 final code install. Download latest RT2860 driver source code from Ralink here. You need to enter a name and an email and press accept to download. Open and extract the downloaded file to a temporary directory in your Home directory. Perform these commands in a Terminal session one at a time. You can cut and paste. Using sudo puts you into Admin mode so you will be prompted for you Admin (probably) your default password. Note you need to replace the asterisk with the actual directory name of your kernel. Consult your file system directory structure for this. This is to prevent the old driver from being used. You could just delete the file as well I suppose. Okay at this point you have made a lot of progress and should be happily surfing at up to 802.11n speeds. Take a break and marvel at your skills and the wonder of the Internet! But, and this is a biggie, what happens if you ever reboot? Unfortunately, you are back at square one without the RT2860 driver being loaded after a reboot. To remedy this situation, read on. Again replace the asterisk with the correct directory name. Add the command rt2860sta on a line at the end of the file. I hope this tutorial may be helpful for some people. Just got finished building a new WHS server using an old Shuttle K45 case that I gutted and installed a Gigabyte GA-D510UD Atom based motherboard. The K45 case allows for custom graphics on the front so I whipped together something based on some Windows Server Wallpaper I found online.The Mini-ITX board installed perfectly. Then all I had to do was boot up the “Vail” install DVD and I was up and running. This will be a great test bed during the beta and may serve as my permanent WHS server once the beta is over. Some pictures below. My acquisition of audio goodies continues. This time it’s the just released F-117 The Nighthawk Phono Preamp from Ray Samuels Audio. Ray specializes in creating high performing minature audio gems. He has gathered quite a following for his line of portable headphone amps. The F—117 is a full featured phone preamp with up to 75db of gain and a choice of loading options all in the package about the size of a pack of cards. It’s other unique feature is it is designed to run entirely on batteries. Using a rechargeable lithium ion battery it is rated to run 8 hours per day for about 6 days! Although break-in time is recommended, I have already completely enjoyed this addition to my system. It is extremely quiet and seems to have loads of dynamic range and frequency extension at both ends of the spectrum. I think the freedom from noisy AC power interference must be a reason for the excellent sonics. Well, I went through a frenzied bit of web editing the other day trying to get my blog re-hosted using a custom domain on Blogger. The impetus of this change was the announcement that Blogger would no longer support ftp publishing going forward. This also corresponded with the fact that my current hosting a e-rice.net was up for renewal at the end of March. So I waited patiently for Google to release their migration wizard. After many delays, it was released. I jumped in thinking this would be relatively easy. I thought I understood the issues but immediately I selected the wrong option and was stuck with a new blog at Blogspot and a failed migration that would not let me back up and start over again. After much hair pulling furious reading, I successfully edited my DNS and Cname records and finished the migration manually. I now have my blog re-hosted at Blogger but still located at my custom domain of ctbarker.info. One issue that caused problems, is that I use google apps and I found that when I tried to change blogger to point to my re-hosted blog it kept saying a blog already existed and would not make the change. I had already correctly changed all my DNS and Cname records but it refused to budge. Finally, I stumbled upon the fact that if you have the Sites featured turned on with Google Apps then this would block you. By turning off the Sites feature, I was able to return to the Blogger publishing menu and it successfully changed to my custom domain. One new problem I have encountered is that when I perform a search of my site the results display but when I select a link it come back with a broken link screen. This may be fallout from my failed migration but I am unsure how to fix this? Also, my blog is still flagged as an FTP blog even though it is now hosted on Blogger and the migration wizard is stuck and will not complete? How to clear up this mess?